receive a free tree bag! All trees being removed from our tree lot needs to have a tag on the stump PRIOR to loading on your vehicle. 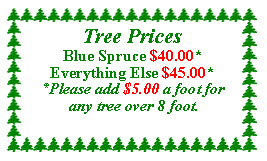 When you return to our tree lot please stop in our Christmas house and pay for your purchases. The cashier will then give you a tag to put on the stump of your tree showing that you paid for it. Don’t be alarmed if you see bare spots in our tree fields. We did some extensive cleaning up of our fields to make room for new trees. One thousand Blue Spruce transplants were planted last year. Please watch where you step as there are baby trees growing in those cleared out fields. Tree Report - This past summer was very good with a lot of rain, in contrast to last summers drought. The trees flourished, but all the rain made it necessary to mow more often. Over the years we have been planting different varieties of spruce trees that have needle retention as good as fir trees. Try the Meyer, Serbian and Blue Spruces. Throughout the year we enjoy shopping around for Christmas items and restore them for resale. We are NOT going out of business! Just having fun buying things and reselling them. Check out our “FOR SALE” items in the GREEN BUILDING, in our gift shop and on our items for sale page on this web site. In every real Christmas tree there are dead needles. This is a natural thing. 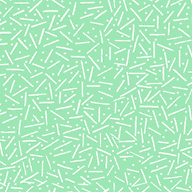 Enter the mechanical tree shaker and watch those dead needles fall out!